Rick Luettich has an undergraduate and master’s degree in civil engineering from Georgia Tech and a doctor of science in civil engineering from MIT. He serves as the Director of UNC’s Institute of Marine Science, which is comprised of approximately 75 residential faculty, staff and students located on the coast in Morehead City, North Carolina. He also serves as the Director of the UNC Center for Natural Hazards Resilience and is the lead-PI on the Department of Homeland Security Coastal Resilience Center of Excellence and on the US IOOS Coastal and Ocean Modeling Testbed. He has published over 100 scientific papers and reports on modeling and observational studies of physical processes in coastal systems. His modeling has emphasized the development and application of unstructured grid methods that are optimized for geometrically complex systems such as sounds, estuaries and tidal inlets and high performance computing systems. He is one of the principal developers of the ADCIRC coastal circulation and storm surge model and has overseen applications ranging from interdisciplinary studies of physically mediated migration, larval dispersal and water quality, to coastal hazard delineation to hindcasts and forecasts of tides and storm surge/inundation along the US coast. ADCIRC has been a cornerstone of US Army Corps of Engineers and FEMA storm surge studies that include forensic studies in the aftermath of Hurricanes Katrina and Rita, planning studies for new hurricane protection systems for the Northern Gulf of Mexico coastline and coastal flood risk studies along the Gulf of Mexico and US East Coast for the FEMA National Flood Insurance Program. It is also being used in pilot storm surge forecasting projects. 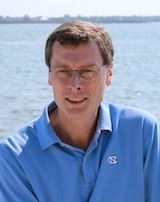 Luettich’s observational studies have included moored and shipboard sampling to characterize physical processes in coastal systems and have often been oriented toward understanding the role of physical processes in areas of water quality (e.g., algal blooms, dissolved oxygen depletion) and fisheries recruitment. He has actively contributed to the national Integrated Coastal Ocean Observing Systems (IOOS) programs. Luettich has served on three recent National Academy/National Research Council committees – one reviewing the factors that led to the catastrophic damage to New Orleans by Hurricane Katrina, the second reviewing the options for a new hurricane protection system for Southern Louisiana and chairing a third committee on Reducing Coastal Risk. He has also actively participated on numerous other advisory committees / governing bodies including the Southeast Louisiana Flood Protection Authority-East; the Science and Engineering Advisory Council for the Water Institute of the Gulf; and as a publically elected member of the Carteret County Board of Education.